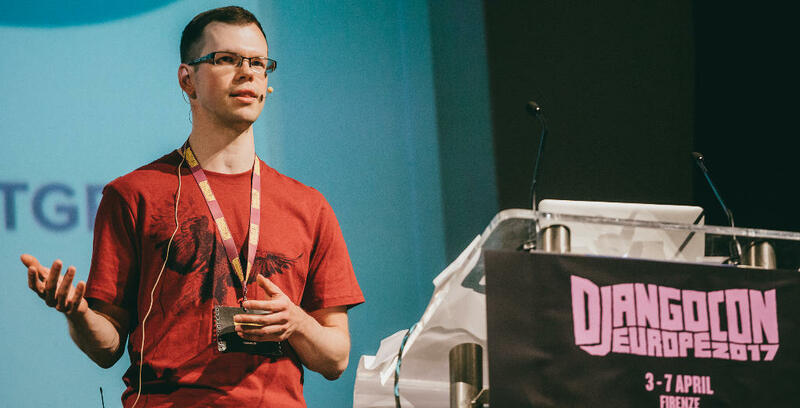 This is an interview I took from Estonian Django developer Rivo Laks about Docker. Recorded in DjangoCon EU 2017, Florence, Italy. A: Hello everyone, this is Antonis from djangodeployment.com. The date is 7 April 2017 and I am in Florence, Italy, at the European Django conference. I’m sitting with Rivo Laks, who is a developer from Estonia. He has a company called Thorgate, and we are going to be talking about Docker and similar things, mostly about deployment. Hello Rivo, how do you like the conference? R: Hello Antonis. I like it a lot and I think it’s my fifth DjangoCon now, so it’s been a pleasant experience throught the years. A: That’s very interesting because it’s actually my first Django conference. So what do you think it is that brings you here? R: I guess it’s the people, most importantly; and also the fact that this is a good place to keep you up to date with everything that is going on in the Django world. A: Would you like to tell me some examples of Django applications that your company makes? R: Well, it usually begins with some sort of business problem. One recent example is a company that manufactures pipes, and they needed a better way of getting an overview and keeping an overview of their production process and production queues, so we helped them with that by creating a Django application that basically contains the schedule for the production, so that they can add new pipes there from their existing bookkeeping software, then do quality assurance as well as use it in the future for actual monitoring of the production. A: You made an interesting presentation a few days ago about how you use Docker to deploy your Django apps. So the question, first of all, is if this is something you have been doing for a long time, and I would especially like to know what problem Docker is solving for you. R: We started looking into Docker because we had some dependency isolation issues, because for more recent projects we wanted to use more recent versions of Python and PostgreSQL, and at the same time we had, in the same server, older projects, running on older versions of Python, which we didn’t feel like upgrading at that time. We hoped Docker would help us keep these requirements and different versions of Python separate for each project. I think it succeeded in that, because we are now able to accomplish that and we have been using Docker in test and production servers for something like six months now, perhaps slightly less. It’s a quite recent development, but all the projects we are starting today are based on Docker. A: I understand that you mostly deploy on single server. So you may have a virtual server and you deploy some Django applications in there. When this problem arose, and you had made some applications that use newer versions of PostgreSQL and Python, why didn’t you just create another virtual server perhaps, and you needed to use Docker to isolate things on the same virtual server? R: We do use quite a low number of servers and put multiple projects on a single server because the projects themselves are often quite small and they don’t require a full server and so on one hand it is financially more efficient to keep multiple projects on a single server, and on the other hand it’s also more efficient for us to not have to maintain multiple servers, because we only have to monitor, configure backups and everything else for a low number of machines. A: There is a lot of hype about Docker; we were discussing this yesterday. It’s a relatively new technology, it’s changing a lot, and it seems like it’s the new fashion that is going to solve, somehow, magically, all your problems, like XML was 20 years ago—I can’t remember any more recent example though I’m certain there is. When would you advise someone NOT to use Docker? R: I definitely agree with you about the hype, there’s lots of hype going around, and it makes it a bit difficult to find good and objective information. When would I advise to not use Docker? I think that if you have a project that’s already running, that’s perhaps a bit on the bigger side, and that you’re not that actively developing any more, then there’s probably no point in moving to Docker. Perhaps you don’t need Docker in some cases. For us there was a very clear need or desire of what we wanted to accomplish with Docker, so if you don’t have that need, if you are looking at the advantages Docker might give you, and decide that these advantages are not really something that are a problem for you, then I guess you can just skip on it. A: Thank you very much Rivo, and I hope to see you again next year. R: Thank you for having me, and likewise. © 2017 Antonis Christofides and Rivo Laks. The interview is licensed under the Creative Commons Attribution-ShareAlike 4.0 International License.